Dre’s main request for Friday’s dinner was Mac & Cheese WITH BACON to accompany my Roasted Tomato, Mushroom, & Smoked Mozz Stuffed Chicken Breasts. On a shopping trip last week, I picked up the most adorable red casserole dish and this was the perfect opportunity to christen it. I needed to refresh myself on Mac & Cheese basics and Alton Brown seemed like my go-to man. I forgot how easily you can turn a basic rue, some milk, onion, & cheese (and bacon, of course) into the most comforting of foods. Mmmm, Mac & Cheese! I put Dre in charge of finishing up the Mac & Cheese. He crumbled bacon and tossed it into the macaroni & melty cheese mixture. The jumbo macaroni were perfectly filled up with the bacon & gooey cheesiness. He gets half the credit on this cooking venture for that move! 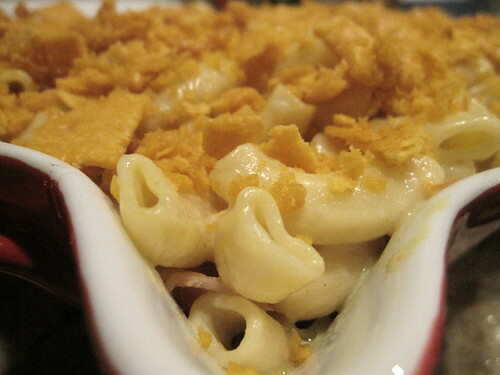 No Baked Mac & Cheese is complete without a crunchy crust and why not have it add to the cheesiness! Dre crushed up some Cheez-Its, tossed with melted butter, and sprinkled on top. 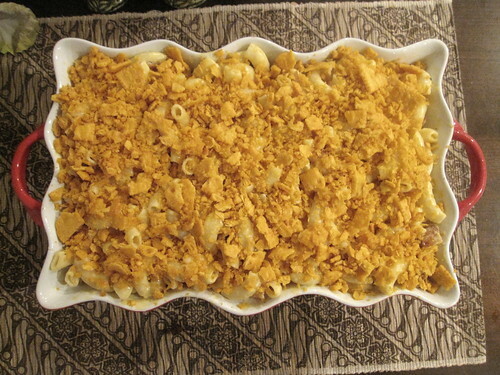 It added a crunchy texture to the creamiest, yummiest Mac & Cheese I’ve ever tasted, if I do say so myself! And how cute is that casserole dish?! Cook macaroni until al dente. Drain and set aside. Melt (3) T of butter in a heavy pot on Med and add flour. Stir for about 5 min until it turns a light caramel brown, watching closely. Add Milk, Mustard, Paprika, Bay Leaf, Onion, & S&P and stir. Bring to a simmer on Med for about 5 min. 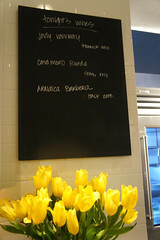 Remove Bay Leaf. 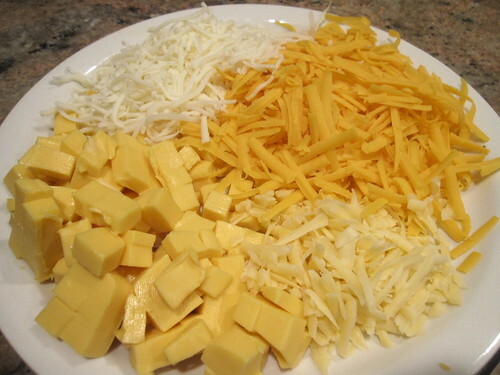 Immediately add the cheese mixture to the pasta in a large bowl or your stock pot and coat. The bacon crumbles can go in now, too. Pour mixture into a large, greased baking dish or casserole. Crush (1.5) cups of Cheez-Its in a sealed plastic baggie and then toss with (2) T melted Butter in a bowl. Sprinkle over Mac & Cheese. Bake for about 30-40 min until bubbling. Remove and let it sit for (5) min before eating. I finally took Dre on an Amish adventure to Lancaster County complete with a stop at Shady Maple Smorgasbord. 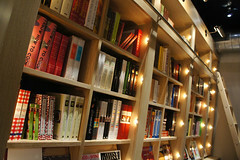 I regret that I went to one of my favorite places to eat and didn’t take any pictures! Shame on me! We did, however, make a few farm stand stops on our scenic ride home where I picked up a beautiful head of Cauliflower. 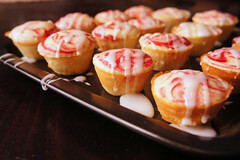 I knew I’d have to transform it into a tasty creation though, if anyone was going to enjoy it as much as I would! I recalled an episode of 30 Minute Meals where Rachel Ray make a quick batch of her Smashed Cauliflower with Cheese. I stuck to the basic parameters of the recipe but impressed myself with the addition of shredded Smoked Gouda (from the never ending wedge in my fridge). 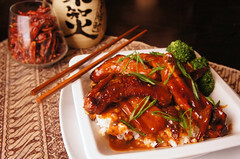 The smokiness really enhanced the depth of flavors in such a simple dish. It was so good, I didn’t even have to pass it off as mashed potatoes, though you know I tried! P.S. We also picked up a pumpkin on our Amish adventure that Dre & I carved for Halloween. BOO! Butter – let’s say 2-3 T of the REAL stuff, no oleo here! 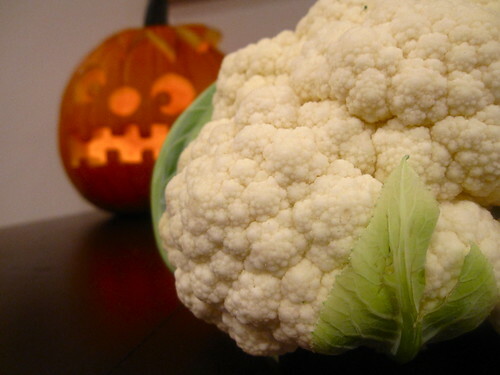 Place Cauliflower florets in a medium pot & cover with Chicken Stock. Bring to a boil over high heat. Then cover & reduce heat to a simmer until Cauliflower is tender, about 15 min total. Add the butter & cheese. Smash with a potato masher, adding in stock until you reach desired consistency. Think “thick grits”! Season w/ S&P and serve. It reheats really well, too, so feel free to make a double batch to enjoy all week! Leftover Lightning! 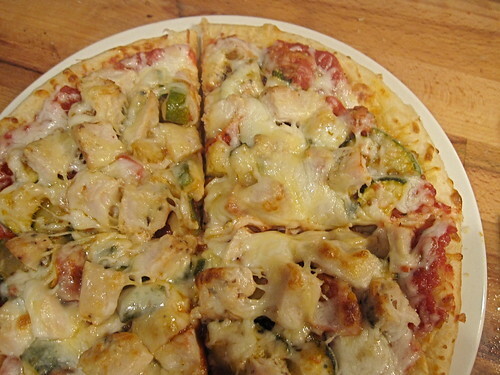 Roasted Turkey, Zucchini, & Tomato Pizza! I’m enjoying the house to myself for an evening, which usually means I have to cram a bunch of relaxation & chores into one night. Amongst laundry, the World Series, & making homemade Apple Butter for Dre, I needed to make sure I had a good dinner to keep me going. I’ve been getting back into cooking on the regular, but kept it fairly easy this week as I’m battling the infamous flu. 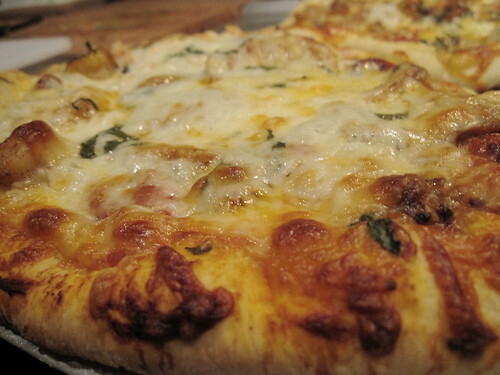 Luckily, I had plenty of leftovers to work with: Pizza Sauce from Lazaro’s delivery on Sunday (Mmmm, Garlic Knots! ); leftover Dijon Turkey Tenderloin, Roasted Zucchini & Grape Tomatoes from Monday’s quick din; and, a leftover 8″ mini Boboli shell (leftover from last night as I pretty much ate this exact dinner). I layered the pizza with sauce, diced turkey, & veggies and topped with shredded Mozzarella & Smoked Gouda (my fave, still leftover from Make Your Own Pizza night). 10 minutes in the toaster oven on 450 and YUMMM! Last season of Top Chef, we started a tradition of “Family Dinners” at my house to watch each week’s episode along with a home-cooked meal! Tom, Dre, & Lex were the regulars at last season’s dinners, but couldn’t be happier to add Sarah to this year’s season. She brought along her homemade pizza dough for the return of Top Chef AND the return of “Build Your Own Pizza Night,” my favorite dinner theme! The original plan was to do grilled pizzas, but after a summer of cooking and roasting Grape Tomatoes (via The Bitten Word’s amazing recipe) & Yellow Bell Peppers for pizza toppings, my grill ran out of gas. At least we always have the oven for back-up. I also prepared sauteed Zucchini, Chicken Andouille Sausage, Crab Meat, & Creole Shrimp, along with shredded Mozzarella, Smoked Gouda, Asiago, & Ricotta Cheeses, as topping options. Can’t forget some tomato sauce, as well! 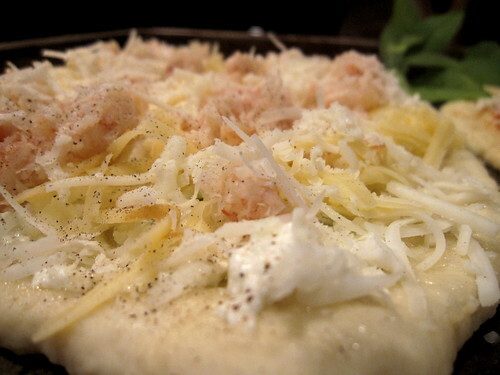 We all got to loading our shells with Dre opting for a Crab White Pizza & Tom piling on just about everying!